I'm often asked at the end of the day.. "How much is a typical tip? "This is an issue I hate to discuss when my clients ask me at the end of a charter. When clients ask me how much is it proper to tip your guide, I usually cringe and give them this piece of advice. First and foremost, It is most important that you feel your guide has worked hard to put you in front of fish (even though it has been totally overcast or very windy). Has he done his job of explaining the process of casting, seeing and hooking fish? Has it been an enjoyable experience out on the water? Most guides, including myself, tend to judge the quality of the experience given and effort provided for the day by one's gratuity. I've received tips of $100 per day and unfortunately for me, those that have just walked off the boat. At the end of a day I tend not to look at checks written or a wad of cash handed to me to count, so as not to seem they are mandatory. I also understand the charter can be a year long savings experience for some. I can assure you, they are GREATLY appreciated. Here in the Florida Keys, where we've the highest cost of living in the state of Florida, (as well as outrageous fuel prices nowadays) they certainly help out. We've dockage fees, fishing licenses (to the State and Federal governments), oil, bait & tackle costs and liability insurance also to contend with. IF you feel you'd fish with me or another guide again, here goes. As a guideline, on a per day basis, a full day $50-$100. half day, $30-$50. 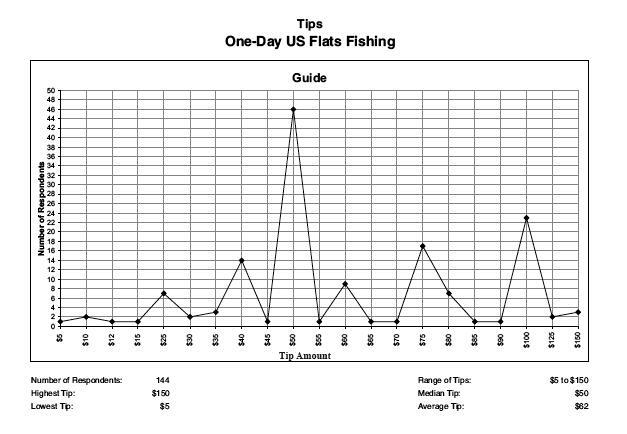 You can see from the chart below, as sent to me from a regular client, with 144 respondents to the survey,(the Angling Report) the average tip was $62, for a full day of guided flats fishing..